Perhaps because it's easy to mistake the Palo Verde Beetle for a cockroach, newcomers, and visitors to the Phoenix area are sometimes horrified when they get their first glimpse of this huge, flying bug. 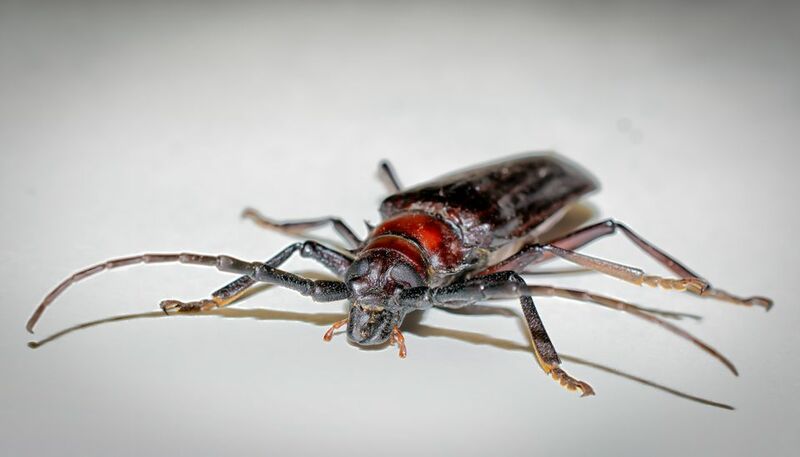 However, the Palo Verde Root Borer (Derobrachus geminatus) is actually harmless, and unlike the scorpion, they do not sting, despite their long antennae, 3- to 3.5-inch size, and spiny collars. These beetles are attracted to lights, so if you are sipping cocktails in the evening on your resort's patio, they may come to visit. They come out in droves each summer during monsoon season, which is also their mating season, and are most active in the early evening. During this time, the adult beetles lay their eggs in the soil, and when the young Palo Verde larvae hatch, they feed on the roots of distressed trees and shrubs, particularly the Mexican Palo Verde tree and citrus trees. After a few years, they leave the tree roots, and you'll be able to see the exit holes around the roots of the tree. If you have Mexican Palo Verde trees especially, keeping these beetles out of your garden really comes down to taking care of your trees and plants to ensure that the roots aren't decomposing—verde root beetles don't really enjoy fresh roots! They are also found in rose bushes and olive trees. It does no good to spray inside the holes after the Palo Verde beetles have already left. Your best bet to avoid having these frightening insects at your home is to keep your trees healthy with proper watering and fertilizing and otherwise leave these harmless creatures alone. If you're just looking to keep these beetles away from your party or social gathering, putting a screen around your porch or investing in a mosquito tent is another good way to keep these unwanted guests out of your event. Otherwise, just be nice to them and they'll likely fly away just as quickly as they came. Although these insects are harmless when you're sitting outside enjoying a cocktail, they can be quite dangerous to motorcycle drivers and people driving in convertibles at high speeds. If you're cruising around the desert on a motorcycle, wear protective gear. Otherwise, these beetles are really only troublesome in that they look frighteningly similar to cockroaches. Their mating season is also relatively short, but be aware that you'll likely encounter many of these beetles if you're in the Arizona desert during the months of June through August, so be prepared. The best way to avoid these beetles during monsoon season is to go to more indoor restaurants and bars and stay away from parks around dusk when these bugs are most active. For more information on the history and biology of these creatures, the Arizona-Sonora Desert Museum has an entire display dedicated to Verde Root Beetles.